Evan at 20 months - Canines, High Fives, and "Dahhhhhh!" Our little Evan has been growing and developing over these past two months since we last wrote an update. He is such a little firecracker - so full of energy and always busy! At 19 months, his language skills were still continuing to develop. We've discovered that he is a little trickster. Every now and then he will say a word - like "chair," "cracker," or even "zipper" or "spider" and then as soon as we get excited and ask him to repeat it, he will act like he never said it. We think he is just playing a big trick on us, and one day he is going to tell us exactly what is on his mind. When we ask him to say words, usually he will respond with "Dahhhhhh!" and a big grin. I did an experiment where I tried to get him to say milk, and he would keep saying dahhhh, and I would keep saying milk, and then I said "m-i-l-k" very slowly, and he copied me, but saying "d-a-a-a-h-h-h-h" very slowly. He was quite proud of himself, to say the least! He has started to say the word "down," although unfortunately it sounds a lot like "Dahhhhh!" Evan's bottom two canine teeth were coming through for much of this month, and boy, are those painful! It's a good thing we don't remember the pain of getting our teeth. These canines kept Evan up a few nights, and he was much happier once they poked through. These teeth brought his total up to 14 teeth. Evan continued his trend of being a little monkey, always so busy and into everything. He always wants to do whatever Seth is doing, and to use whatever Seth is using. We are working on teaching Evan to share with seth, as Seth is a good sharer with Evan. At the moment, Evan lets Seth know he wants something by screaming and grabbing it, so we are working on that with him. 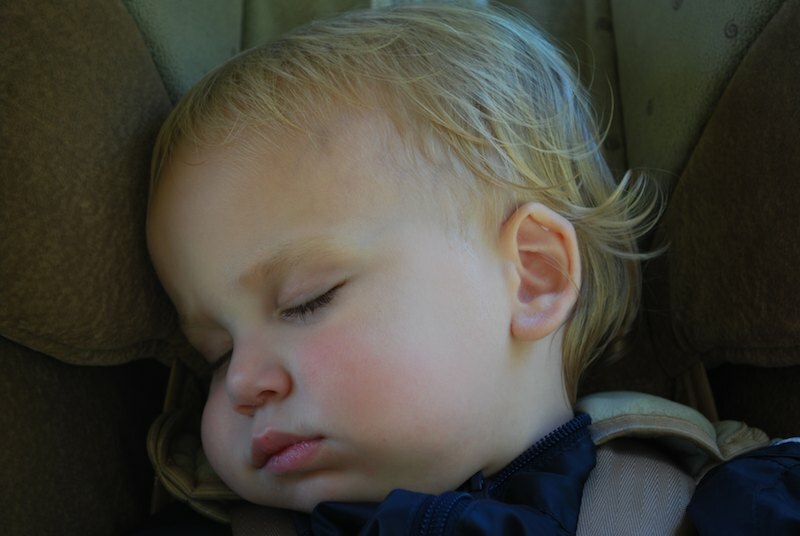 Recently he became very interested in fastening buckles on things - the baby seat, the carseat, the wagon, the stroller. However, he won't accept help and then gets very frustrated when he can't do it. He did figure out how to do the carseat buckles, and he gets the biggest grin on his face when he does it right. He also has recently decided that he wants to be like the Super Readers on Super Why, a show Seth likes to watch. They do this little dance at the end, and Evan has to do the dance along with them at the end. He gets frustrated if we don't let him do it just at the right time. Seth gets into it, too, and they bounce up and down together, and Evan waves his hands and gets his little bottom low to the floor. Pretty cute! Evan also really likes when we all hold hands and say "Blessings on the Meal," a meal-time prayer we learned from Uncle Brian. Evan wants to keep holding hands and signs "more" for us to do it again and again. He also has recently decided that he likes dessert! He has gotten into cupcakes (loves frosting), and it is so cute to see him eating ice cream. He just says "Mmmmmmmm!" Evan also loves those little routines of toddlerhood. Whenever we ask him where his body parts are (head, eyes, etc. ), he touches them on his own head, and then has to touch them on all the other people in the room. 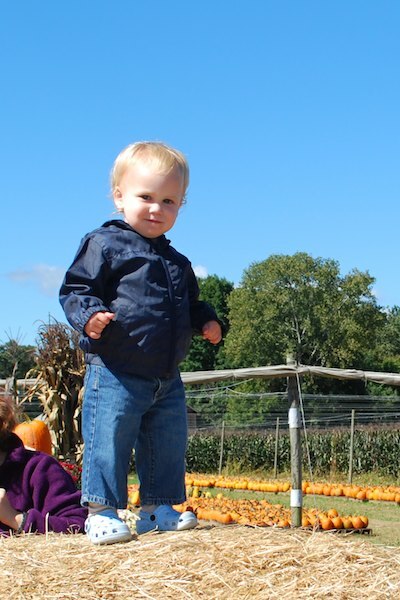 Today at 20 months, Evan is starting to let even more words slip, at home and at daycare. I think being back around the other kids is giving him a little bit of peer pressure. They told us when they asked him how his diaper was, he said "good." Also, at home, he has started saying "car." Like he had an epiphany one day when we were in the car, he started saying it over and over again. He has also started saying "No no no" and "Yeah." When we ask him questions about day, he says this funny little "nnhhh" sound when he wants to say yes. Seth has decided that he is the only one who can teach Evan new words, so he is often trying to get Evan to repeat things. Very cute! Evan's top two canine teeth made their appearance this past month, bringing his grand teeth total up to 16. These were just as painful as the last two, and we were glad for his sake to have them come through. One night he was up for a couple hours writhing around, and we took him to the doctor in case he had an ear infection, but it was just those teeth. He did have a case of pink eye after we started back to daycare, but luckily we treated it quickly and it went away. Evan is still a good eater, and he loves to drink milk, so much more so than Seth ever did at this age. He can still be a picky eater, but when he is starving he will eat more of a variety. The last time we put him on the scale at the doctor's, he was close to 26 pounds (he had been about 24.5 pounds after his 18 month check-up), so he is putting on weight just fine. He goes to bed around 7:30pm, and usually sleeps through the night at least until 6:00am, later if we are lucky. He takes one nap each day, after lunch, ranging anywhere from one to three hours. He will nap in the car if we are on a long ride. We've discovered recently that if he falls asleep even for a couple minutes in the car or in the stroller when it is not nap time, then he won't take a nap at all that day!! So we are always trying to keep him awake until nap time. He is getting better at concentrating on things for longer periods of time. Recently, he has been able to do puzzles with chunky pieces on his own, and he loves stacking and playing with Seth's little cars. He likes to make them "vroom" and he likes to make Seth's little dinosaurs "Roarrr!" When he throws things he says "AAHHHH," and he likes to go around the room and give lots of high-fives to everyone while saying "AAAAHHH!" He is always so busy - he likes to pick up as many things in each hand as he can - two balls in each hand, several blocks. He loves to choose his bedtime books, but hears 2 pages and then pushes the book away, ready for the next one. He likes to turn the pages faster than we can read them! These days he likes Bear Snores On, a potty book, Where Is Baby's Belly Button, Big Red Barn, the Peace Book. Seth likes to bring new books in for him to read. 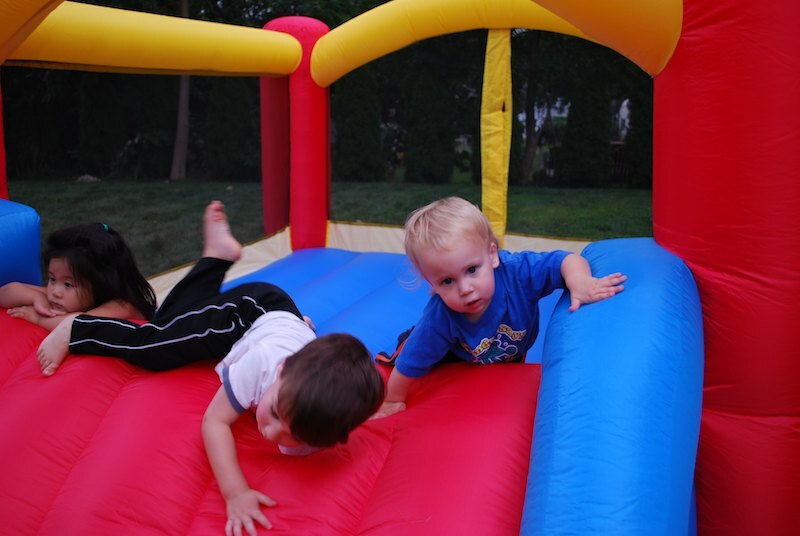 Evan and Seth are having lots of fun together, playing more and more with each other. Seth tells me that Evan gets so excited to see him at daycare. He sees him, screams "Dahhhhh!" and runs over to him with a big hug. They love to take baths together and snuggle together (for a moment). We are all having a lot of fun! Evan's little toothy grin (especially when he is being purposefully mischievous,) is priceless!